With cashless payments getting more prevalent each day, options are popping up left and right. Meet PaidUp, a cashless mobile wallet designed with food in mind. PaidUp is designed to make cashless transactions in various food establishments. However, the kicker is that you can also place orders on the app itself. You can place an order in transit, pay for it, then just pick up your order once you get on the establishment. No more queues to wait in line for. 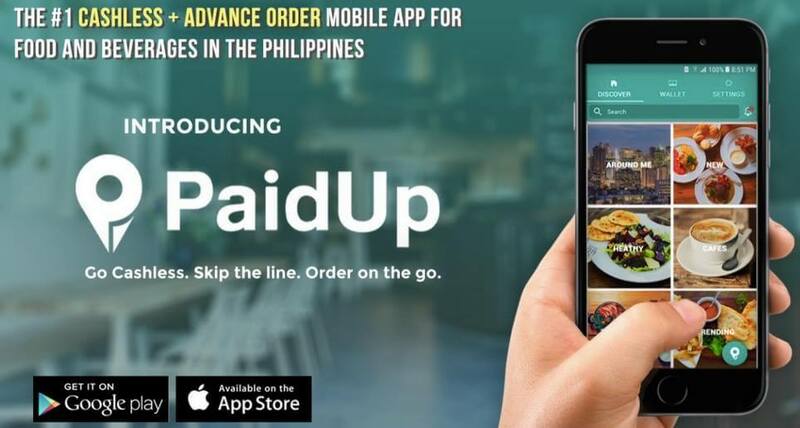 PaidUp first started to be used in various partner cafes and restaurants in Quezon City and, now, expanding into BGC. There are over a 100+ partner restaurants and cafes on the app including Jamba Juice. Auntie Anne's, AppleBees, California Pizza Kitchen, CoCo and more. PaidUp is also helping small and medium businesses by providing rewards to their users. For instance, if you load PHP1,500 on your PaidUp account you will get a free whole pizza in one of their partners. This will give the smaller businesses a chance to promote their products. You can get the PaidUp app in the Google Play Store for Android and the App Store for iOS.